We are involved in manufacturing and supplying superior quality Colloid Mill Machine which is manufactured as per the client requirement. 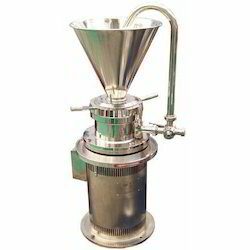 Our range of colloid mill machines is greatly admired and appreciated by our clients for its sturdy construction, superior quality, and durability features. - Being into this business, we bring a comprehensive range of Colloidal Mill that suits best with the demand of latest demand. Colloid Mill is basically a machine, which is used to reduce the particle size of solid in both suspension and liquid. Other than this, the machine that we offer is used to reduce the droplet size of a liquid that is suspended in another liquid. Known for easy installation and operation, our range maximizes the productivity of the process.